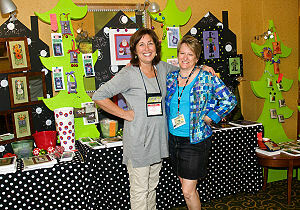 Amy Bruecken -- 1/2 of Sisters & Best Friends -- introduces her new design company, AB Designs! Now, you can tell which designs from Sisters came from which sister!!! 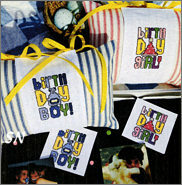 Printed as colorful 4-color charts, each often comes with its necessary special embellishments! Partying with Amy and her Besties! 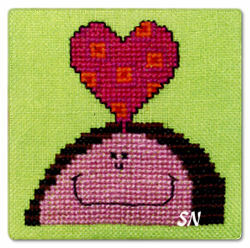 Amy has several new designs... all of them are cute, colorful and fun to stitch. 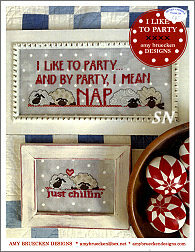 Her 'Liking to Party' set offers two different party options... Stitching or Napping! 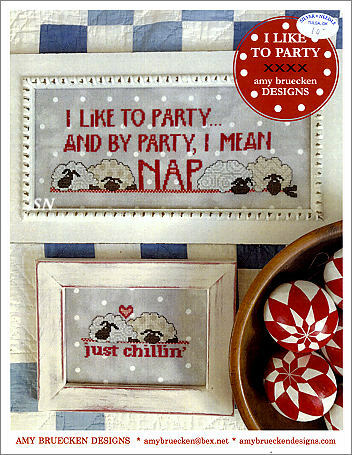 Those 4 sheep are super-cute - look at the swirls and dots in their wool! 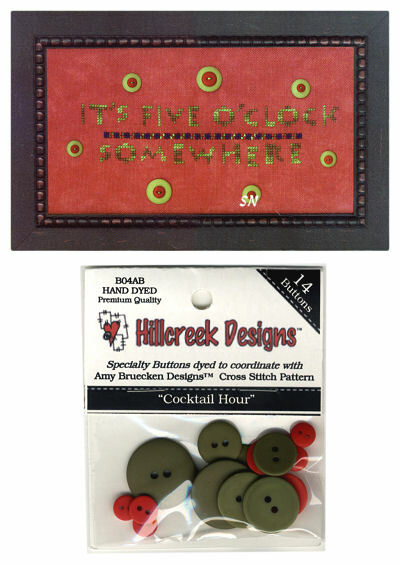 Pick a fun fabric, she's coded these for DMC, and tells you to add buttons or whatever else floats your party-barge! Besties is a cute set of three 40 x 40 designs - frame 'em, cushion 'em, make block stand-ups. If you don't stitch the square outline around them, they'd fit on the Heart in Hand Heartware pieces... and you might need to add some JABCO or Puntini Pins to them! 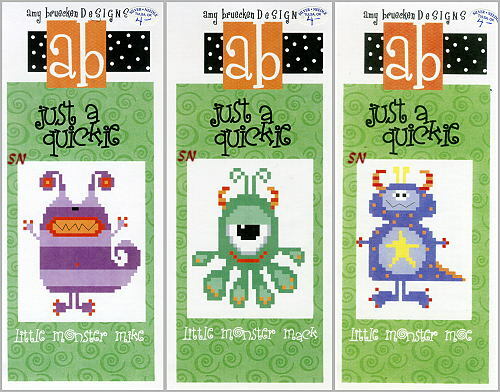 Three more fun designs by Amy, each is presented in it's separate chart and begs to be done on some obscure, fun fabric from your stash! Anything goes on these!!! 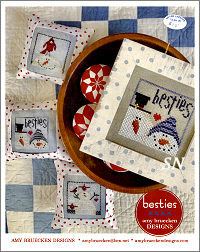 A Stitch a Day - Three different fabric options right on the cover! 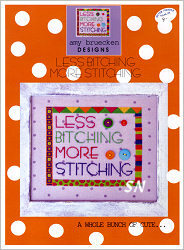 Stitching is only 88 x 50... personalize it... add embellishments? Even a cute pin cushion!!! 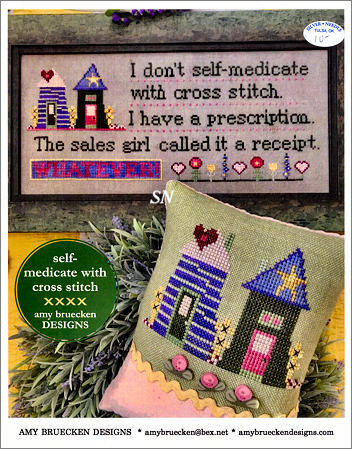 Self-Medicate - Sounds like a good plan to us - what a smart sales girl! Brings a smile to your face, doesn't it? 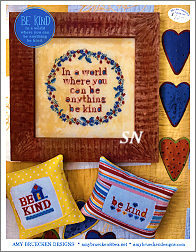 Be Kind - Well, those are good words! Stitch this on just about anything... change colors if you like... just display it where it will be read! 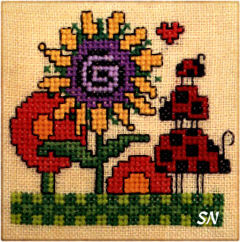 The main design is 100 stitches square, coded for regular DMC. 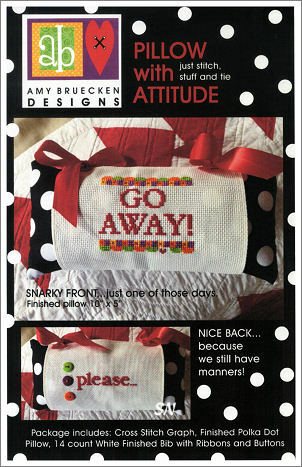 A Pillow With Attitude... Go Away Please! 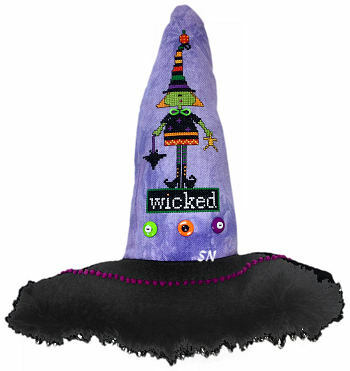 Hey, this little guy companions Amy's Witch Wine Bottle Cover that came out last Fall! New -- you'll be ready for Christmas in plenty of time this year -- or maybe even Christmas in July! *Dear Santa... Please bring wine! * Stitch the little panel, then use Amy's felt packet to construct the darling bottle cover! 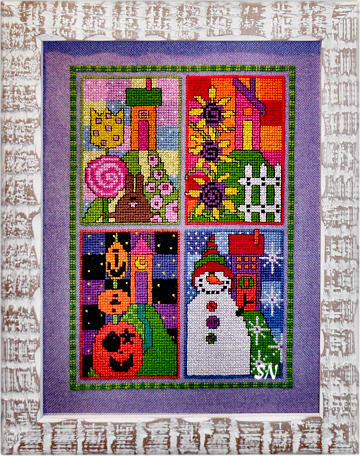 Two other stitched patterns are included in the chart. 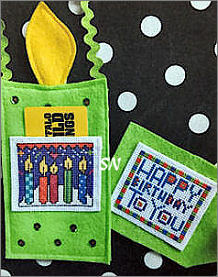 Chart comes with set of buttons and pattern for bottle cover. The felt packet contains JUST the felt needed for the cover construction. These really are cute! My Dad used to wear those wool plaid shirts like the one in the pic... I don't need to say any more! Presented as a single card chart with 3 designs... each is small. Match threads to your garment fabric... just such a neat idea!!! 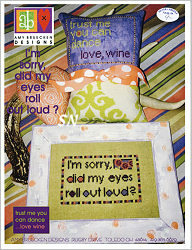 She has a pair of charts... just funny sayings that are super fun to have on display in just the right places!!! *I'm Sorry, did my eyes roll out loud? * & *Trust Me, you can dance! 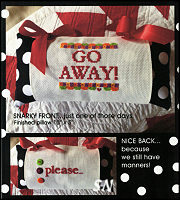 *Both designs together in this chart -- do them on any fabrics, change out the drink if you don't like wine! 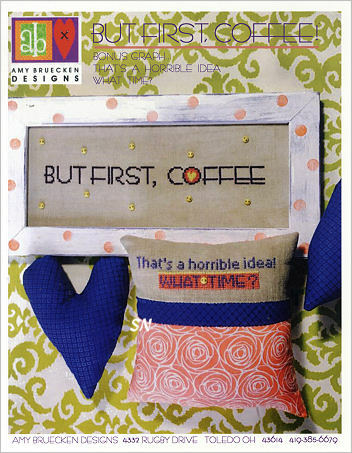 *But First Coffee* and *That's a horrible idea* -- Both designs in this chart, they come with a smattering of small green buttons. You can even add some of the PuntiniPuntini coffee buttons! Again, any fabrics you want, change colors too if you want! 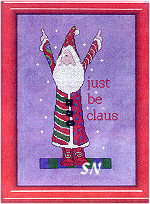 AB Designs has sent two small Christmas designs that will just make you smile. Presented in chart format - there are no special buttons or anything - they just feature that fun polka-dot Belfast linen, and Amy's charm! 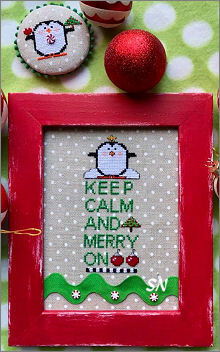 Make the larger pieces (3 x 6) or the ornaments/pin cushions 3 x 3... there are several options open. 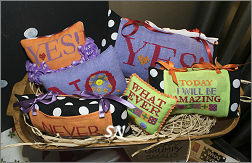 AB Designs has a ton of cute new things! 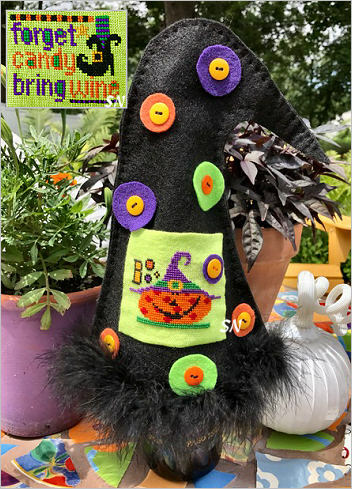 Witch Hat Wine Cover -- YOU NEED THIS for Stitch Group! 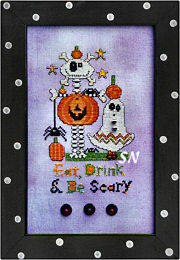 Stitch either 'Boo' or 'Forget candy, bring wine!' on Weeks 30ct Chartreuse with DMC. Then whip stitch together two pieces of black felt (templates and instructions included with chart) to make a bottle cover witch hat. 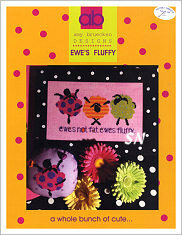 my has included brightly colored buttons for embellishment -- WE NOW HAVE A FELT PACKET TO CONSTRUCT THE BOTTLE COVER!. Choose it below if you want one! Chart with buttons. The Early Bird -- *The early bird can have the worm because worms are gross, and mornings are stupid! * Choose a pretty yellow shade of fabric... Amy has a few buttons on here. 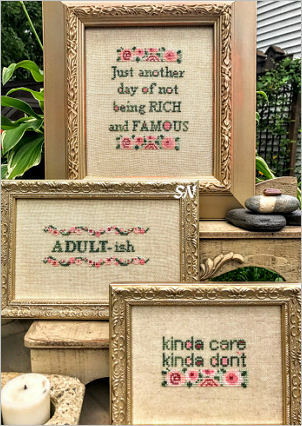 Adultish -- *kinda care... kinda don't*... *Just another day of not being rich and famous*... each design (all three are in the leaflet) is stitched on 30ct Beige -- just choose a neutral, and dig through your floss for some cute colors! No embellishments for these... just do WHATEVER you want! 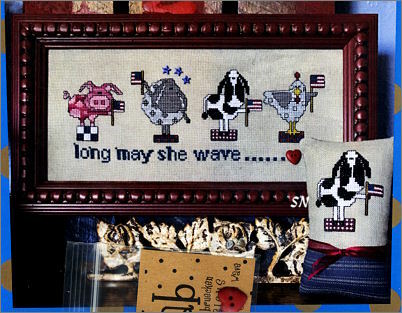 AB Designs is in a patriotic mood... she's sent two designs to celebrate!!! 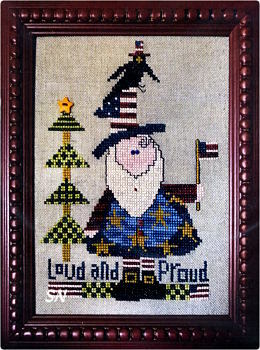 Loud and Proud (67 x 100) would be cute on a light blue or even crisp white -- he is stitched with DMC or hand-dyed flosses and is garnished with a smattering of small buttons. 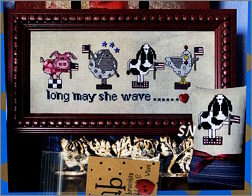 Long May She Wave MIGHT be referring to the cute little animals, besides the flags! Stitch them all together or make a set of 4 little cushions to nestle together in a summer basket. 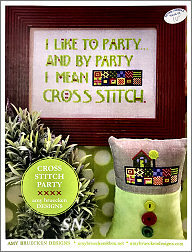 Individually, they measure about 40 stitches in size -- so they're cute and bitty! 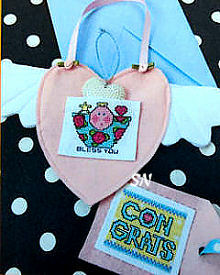 Chart comes with stars and a heart button. 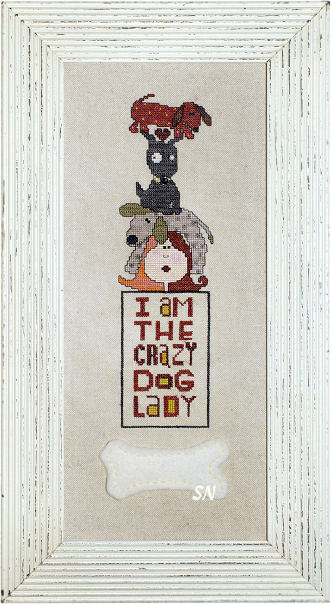 Crazy Dog and Cat Ladies! Two of AB's new designs... we all have that friend who is NUTS about their cat or dog... they dress them, they cook real people food for them, they skype with them, they even stick them in their purses to go shopping together! (well maybe not the CAT!) Anyway, she needs this! Dog was released a few weeks ago -- Cat just came. 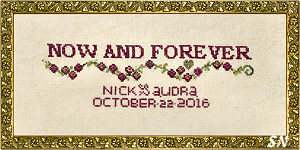 Offered as two separate charts -- both measure 61 x 133 in stitch count -- about 6 x 14 on 14ct. CAT comes with a felt fish for trim, DOG comes with a felt bone. 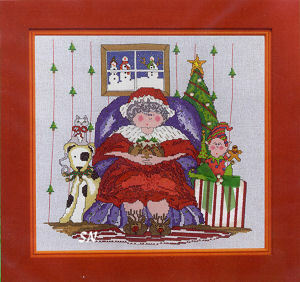 Cute as can be... you could skip the top two cats to save stitching time... but not if that offends that Crazy Cat Lover! BRRRRR -- A cute pair of designs that are simply snowmen!!! 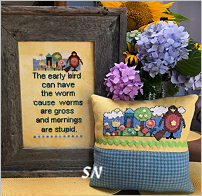 Choose a favorite fabric, each of the little round heads is stitched with Weeks Grits or Cattail floss, and their noses are done with Terra Cotta or Red Rocks. 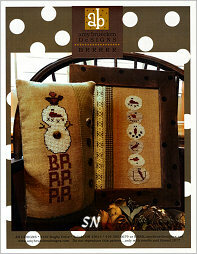 The pattern comes with 5 garnishing buttons for the pillow finished piece. You could do these on a frosty blue fabric, or opalescent... add a couple of bird buttons here and there, or even add Amy's signature *Stitcky-Outey* clay noses!!! 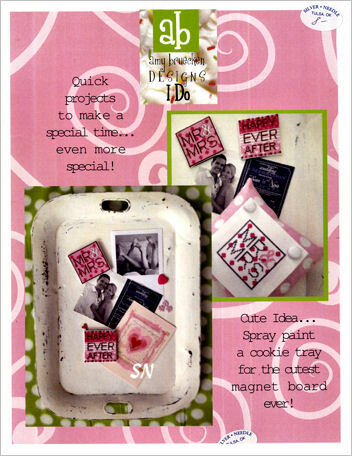 This is a limited edition kit -- it includes a fun miniature hanging chalk board -- you get to write a message on it! The bit of Cross Stitch is worked on Week's Dye Works 30ct Periwinkle Linen with DMC floss. 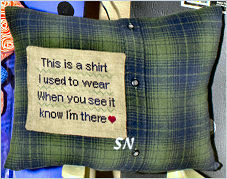 You make that pillow and a little stuffed heart, the linens, threads and flannel for all that is included in here. 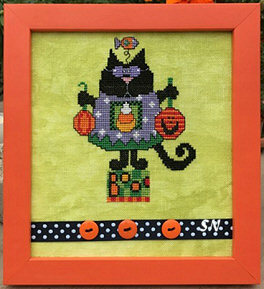 Then, tie on the orange-y yarn, and hang your pillow on the (included) hook of the cute 3 x 5 tin chalkboard! Amy says you will make a heart smile! 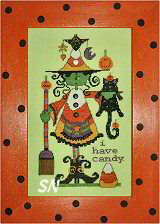 A sweet little 3 x 7 green witch, standing here so quietly... she doesn't look a bit wicked to me! Presented as a chart with embellishments, she is stitched on Weeks Peoria Purple linen with regular DMC floss. 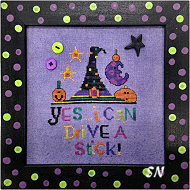 What a cute girlie thing to stitch for the newest teenage *driveress* in your house! 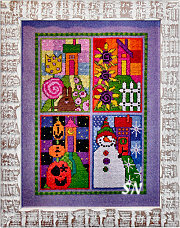 Stitched on 30ct Peoria Purple linen, this finishes just about 5 x 6, and features lots of bright, happy color. There is even an annoying little brother spider thing lurking down there that says EEK! 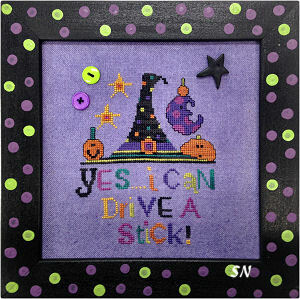 Presented as the chart with embellishments, just something fast and fun - like your new driver! This is kind of fun... another 3 x 3 design that would fit into Amy's Fridge Art magnet series, but isn't, the features a suggestive shoe. It is stitched on a delicious piece of opalescent yellow to mustard-gold Lugana material which is included with the chart. Well in a perfect world, I guess! AB has a cute design that needs to be mounted on a chalkboard stand or something -- some sort of presentation to preside over the tempting Christmas Cookie tray of sin! 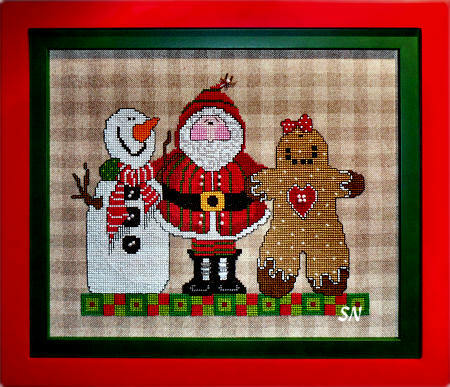 Her pattern comes as a chart with cuts of two different colors of brown wool, red heart buttons and DMC Memory Wire Thread for icing decorations to make delightful felt gingerbread men! 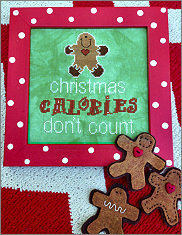 The stitching is only 5 x 6-ish on 28ct... so this is a creative, quick thing to dress up your kitchen cooie tray! Hang this little baby above the family coat rack in your back hallway or mud room. On Crossed Wing's AWESOME Snow Squall hand-dyed linen, all you add are a few DMCs. The chart comes with the yellow buttons and AB's signature *Sticky-Outey-Carrot-Nose. * (Amy's sons used to make those to earn money when they were 'under-privileged, over-worked' teenagers in high school... they remember them with fondness!!!!!!) 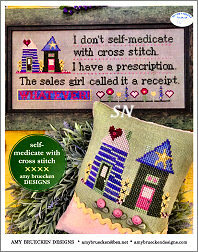 Stitching measures approx 6 x 8-ish. 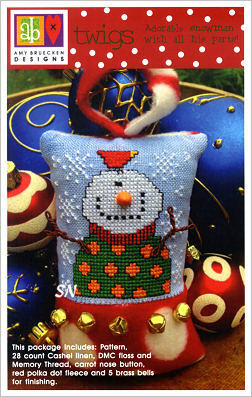 Ab Designs has a fun new ornament design -- a fashionably dressed snowman featuring a sticky-outey nose and wired Memory Thread arms! 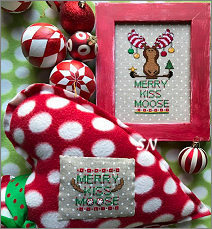 Presented as a kit, you get the28ct ice blue linen, DMC flosses, 5 jingle bells, the little AB Designs clay carrot nose, the red and white polka dot fleece finishing fabric, and cuts of DMC's covered wire Memory Thread. Mr Twig is only 3-1/2 inches in size. Stitch him, and finish him with some of the red fabric showing -- or simply put it on the back side -- the bells can dangle from the corners of bottom. His arms are the twisted wire, and they go on last! Super cute and colorful! This is kind of a fun pair of designs... they don't really GO together... but they follow the same color scheme. Weeks 30ct Straw Linen and the same colors of hand-dyed flosses used... they are just simple, cheerful and make you smile. 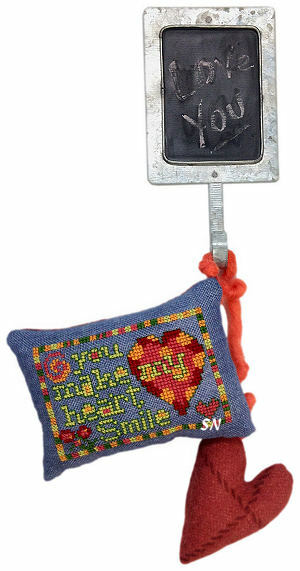 Presented as single charts, Stitching measures 77 x 55 -- it'd be cute on the front of a sewing case or something. Bee Happy measures 89 x 44 -- 3 x 6... very petite! Get out all your fun colors of fabrics to stitch these designs... these are on various counts of Week's Peoria Purple, Chartreuse and Pumpkin. Amy says they are good for 'Sending a Message' or just perching in a bowl -- if you are the more silent type! 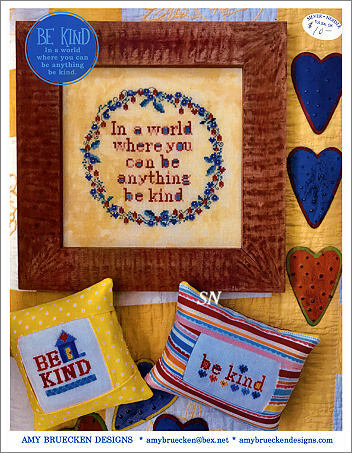 Colorful, cheerful, wild... all are included in the one set of patterns, no specific embellishments called for -- although you could get imaginative with those yourself. Charted for regular colors of DMC floss (700, 742, 971, 553, 321, 310 and 907) -- these colors give you a basic suggestion -- get into your hand-dyeds for these as well!!! Included are: NEVER EVER, NO, WHATEVER, GO AWAY, TODAY WILL BE AMAZING, THANK YOU, THIS COFFEE (TEA, WINE, COLA) IS MAKING ME AWESOME, AND YES!!! A cute trio of snowmen... Amy suggests these both ways... just the folks. (6 x 3) ... or the saying on the top as well.,(6 x 6). 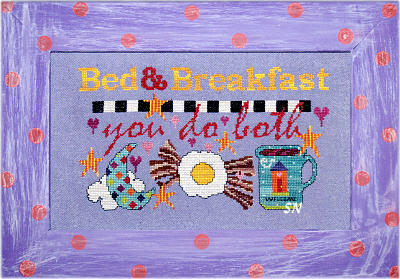 Hers is stitched on Week's 30ct Peoria Purple, but says colors of Aida are good too -- YOU decide, it's YOUR stitching! She has given you SIX of her famous orange noses in here -- they are the CUTEST things on snowmen, because they stick straight out! Presented as the pattern with noses, this is charted for DMC floss. 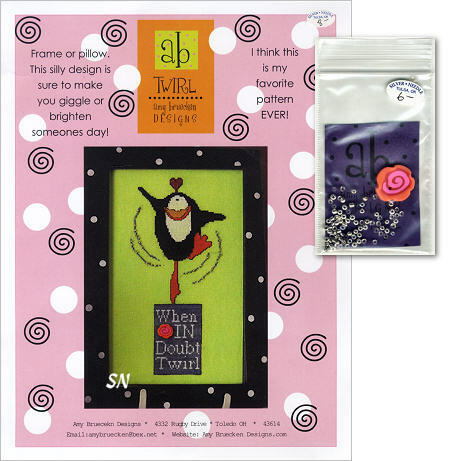 AB Designs releases a trio of quick designs... all are presented as single-sheet chart designs -- you add YOUR embellishments! 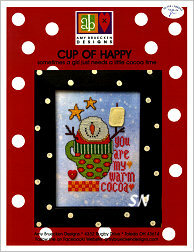 Cup of Happy -- Well, this is just the cutest little guy! Stitched on Crossed Wing's Snow Squall Linen -- which is the most beautiful hand-dyed blue linen EVER -- he finishes approx 5 x 6. Bright and happy colors, he's done in DMC 666, 971, 742, 700, 704, 433 and black and white!!! 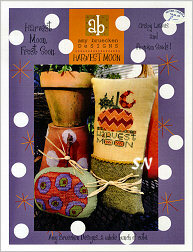 Harvest Moon -- A pair of pumpkins with personality -- I think I am seeing green Olives with pimentos in one of them!!!! (The After-5 Pumpkin!) 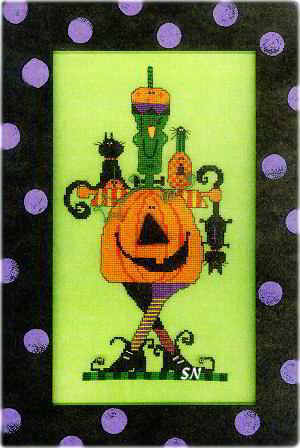 3 x 4-ish sized designs... something wild to add to your fall decorations. 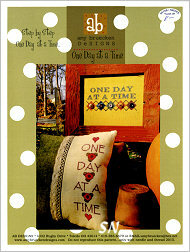 One Day At A Time -- Very good advice! The argyle version really can be stitched with any color scheme... find some cool/special/ family-meaningful buttons and work around those if you want. 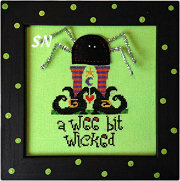 A cute little kitlet by AB Designs, this one includes the chart, precut wool spider, glitter legs and pearl eyes. You supply your bit of brightly colored linen or aida. 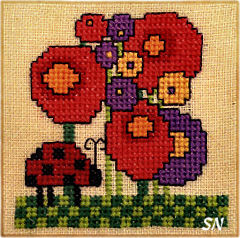 This finishes about 6 x 6, and uses DMC floss from your stash. 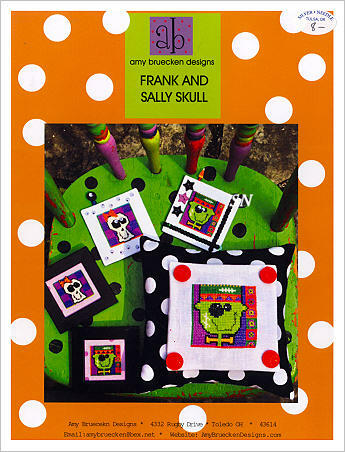 AB Designs has a pair of new charts for Halloween that over-the-top colorful, funky and wild -- just like so many of her other creations!!! 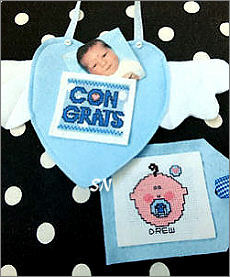 Both are presented as the charts with a few button embellishments. 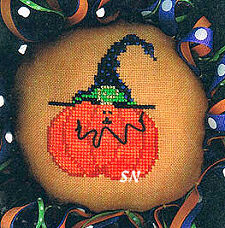 Stitch them on Weeks purple, orange, green or yellow hand-dyed linens... there are tons of color choices! 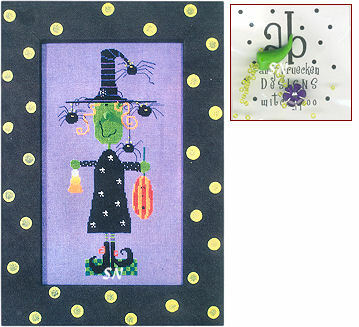 Wilhelmina the Little Witch is stitched on a light purple with regular DMC floss! 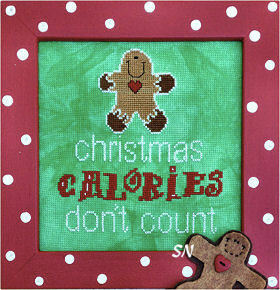 She measures 50 x 105 -- so she's not too large to finish in time for the Big Night! Eat, Drink & Be Scary is on more purple, and agian DMC floss -- 67 x 107, so these could be a pair! More Fridge Art! -- I Do and Baby Love! 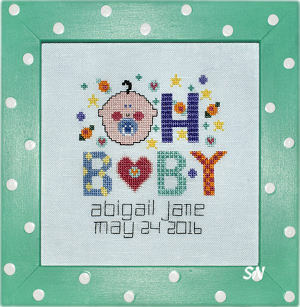 A pair of charts that each feature two small designs for The Happy Couple or The Cute New Addition! 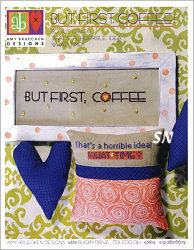 Stitched on just about anything you want, charted for DMC flosses, pillow them, frame them, magnetize them !!! Amy Breucken latest Fridge Art design is presented in a kit format -- it was a Market Special this past Winter. Stitched on Week's Dye Works 30ct Chartreuse hand-dyed linen with Weeks flosses, it is garnished with black glass beads for the seeds. Algerian Eyelets for the rind. 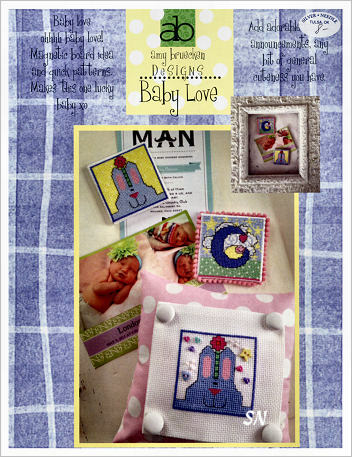 stitch, mount it onto the peel 'n stick magnet material, and stick onto your fridge or filing cabinet! Meant to be something cute, colorful and quick. Note! Since this is a limited edition kit, it isn't included in our Auto-Ship. *Live Simply, Be Grateful, and Smile A Lot! 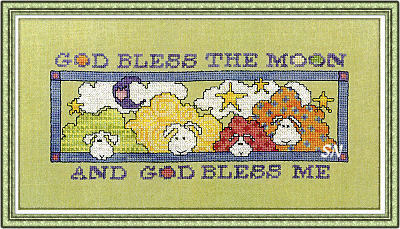 * Each of the 4 panels in this measures 40 x 60 in size. 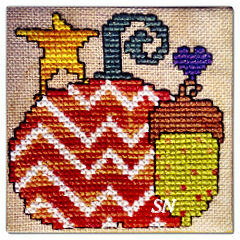 Charted for DMC floss, stitch them all together or individually -- you decide! No special embellishments called for either -- but I bet your stash has a boatload of cute stuff you could use! Amy is beginning a new set of fun designs that are *suggested* as Fridge Art... but could be finished other ways as well. Releasing 4 new designs every other month... these little guys are designed to be stitched on either 14, 18, 22, 28, 32 or 36ct -- because all those sizes fit the 3 x 3 magnet boards included with each. Very *Plucky and Perky*, each of these comes as its own chart with sticky magnetic board and sticky mounting board. You add the flosses and fab of choice. 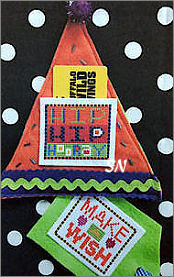 No major finishing or measuring... these are simple, colorful and fun! From now on, our Auto-ship will send 4 new small charts with magnetic material each time. The numbers are up to 24 now, and still climbing! 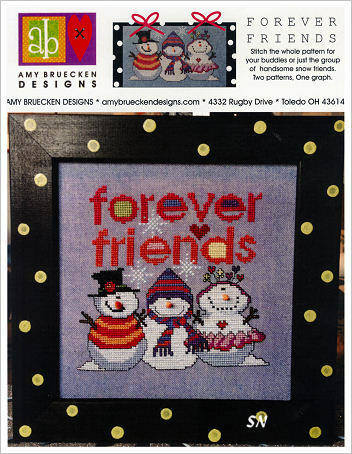 Amy Breucken is getting ready for NEXT Christmas with this Out-of-The-Box group pic!!! Stitched on 30ct Natural/Straw gingham Linen in regular DMC flosses... the 'normal' ends there! 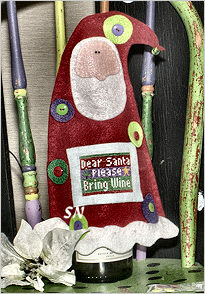 Oh... Amy does a Santa Claus every year, and this year, he brought his *Mrs* along!!! 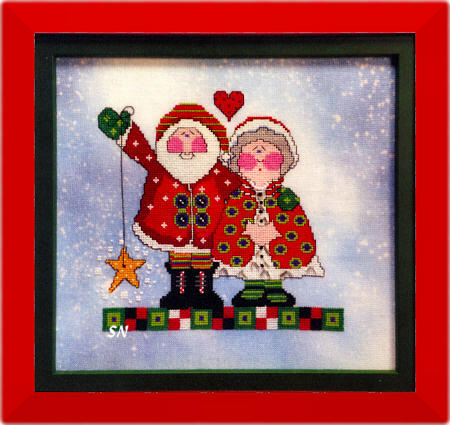 The happy couple is worked on 30ct Snow Squall hand-dyed linen with regular DMC flosses. Her fur is trimmed with silvery glass bugle beads, and she has a tiny pearl necklace! 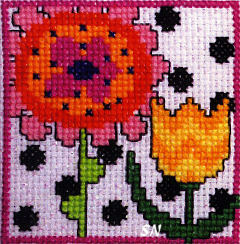 Finishing approx 6-1/2 inches square, they are colorful, charming and so cheerful! 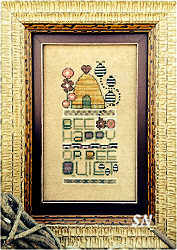 Offered as the chart with beads and pearls offered separately. TOO CUTE!! 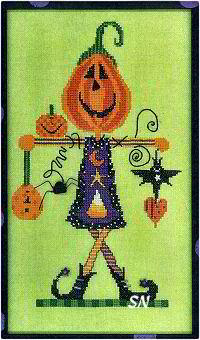 Meet little Lindybug -- The Happy Pumpkin Girl! She's dressed in purple with green polka dots, and advertising CANDY as a dietary option! 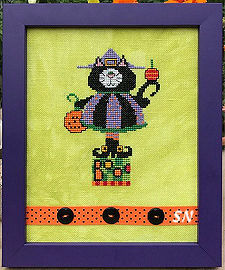 Stitched on Week's 30ct Chartreuse Linen with regular DMC floss... she has a whole collection of JABCO buttons surrounding her, and her dress is hemmed with a length of Dames of the Needle's bright hand-dyed mini-pom-pom fringe in a hot orange color!!! Too stinking CUTE! Finishing approx 4-1/2 x 9... she needs to be finished into a flat door hanging, or a stand-up so she can keep guard over the Candy Bowl! Offered as the chart, we have the buttons packs separately, and we've tucked that bit of the orange pom-pom trim into the button pack sets. Frank and Sally Skull and I Am The Witch! 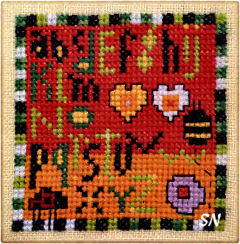 Two more pairs of small designs -- the same size (just 40 x 40 stitches) as the Fridge Arts. 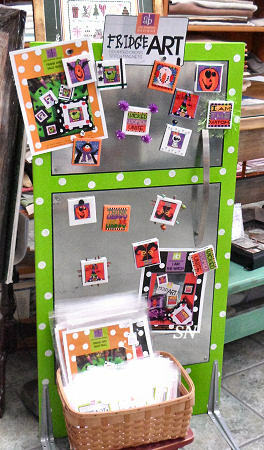 You can get that plain magnet material -- option below -- and finish these into MORE Fridge Arts... or the little pillows and frames as shown. These 4 are offered in chart format. The black frames are from Olde Colonial, and the black and white polka dot pillows (you'll need to stuff them, but they come with the orange covered buttons and are fully sewn for you.) are from Adam Original. We have 'em all!!! 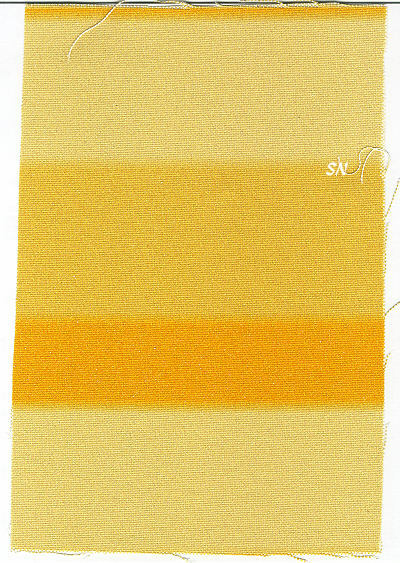 For fabrics, look into Weeks bright yellows, oranges, chartreuse and purple hand-dyeds... or the Zweigart bright tropical Aidas... we have all those, too! Frank and Sally come on one chart... I Am The Witch comes on the other chart. 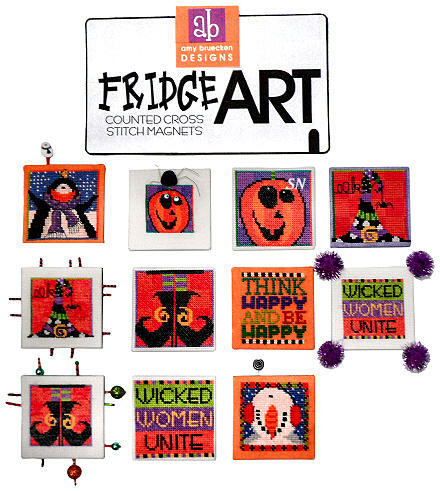 They are not part of the Fridge Art Auto... but you can add them to your collection anytime!! Doesn't need much more explanation than that!!!!! Grab a cute fabric and your bright colors of regular DMC floss and stitch this as the traveling banner for your stitch group meetings!!!!! 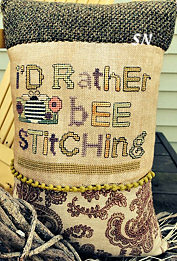 It'd make a cute personal stitching case as well... (in case you'd rather have a more private reminder!) Just a fun design, this is offered as a chart with optional button pack. On 28ct it finishes approx 7-1/2 x 8-1/2. This is SO CUTE! Ms Amy has outdone herself with this fun pagent of Trick-or-Treat hopefuls! Worked on the delicious 30ct Weeks Peoria Purple Linen in both Weeks and Gentle Art overdyeds, it finishes a petite 6 x 9. You can do the whole thing, or split everyone up and make smaller individual stand-ups. Colors are fun, subject matter is over-the-top creative... you could even do those stars in metallic, and put beads in the witch's dress. 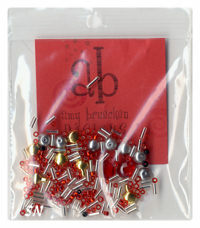 Offered as the chart with packet of mini metal brads and rubber band embellishments! 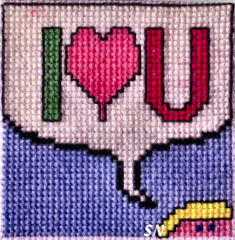 What a sweet piece to stitch for someone you love! 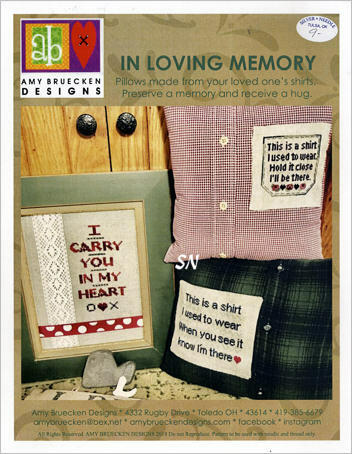 Amy Bruecken has a new design that is so simple but super charming. 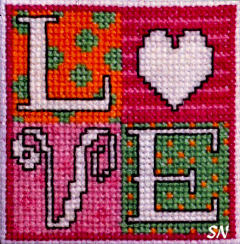 Choose any fabric you like... and six DMC colors -- stitch the hearts with or without the black and white checkered border. BUT... you could add metallics or buttons or even Memory Thread to this and make it really wild. What about personalization? Amy has included a small blocky alphabet.. but you might be able to design your letters based on those already in the verse. It's just the happiest thing!!!!! Offered as a chart. 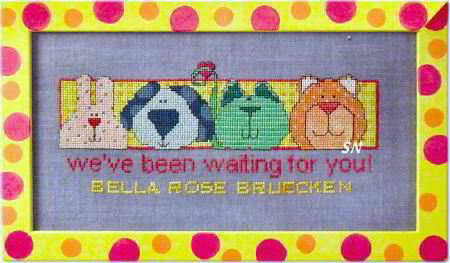 A new design for a favorite verse... Amy has chosen some pretty and bright lip-puckering colors to stitch this cute piece -- 5 of which are your NEW DMC COLORS!!!!! If you haven't picked up your set of the 16 new colors yet... you'll need to for this one. Worked on Week's 30ct Sophie's Pink linen, the fluffs finish approx 9 x 5. Just cute and cheerful for the new year, this is offered as a single sheet chart. Well... SHE has candy! If you are looking for a colorful, happy and shocking Halloween Decoration -- stitch Woneta! 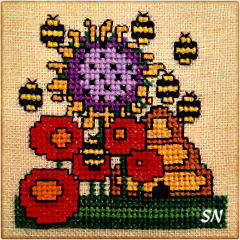 (Amy's sister's name is Koneta... this pattern says that Woneta is Witchy Poo's Big Sis... could this be a recent family photo?) Check out the bat on the candy corn hat... that darling little kitty -- just hanging there! 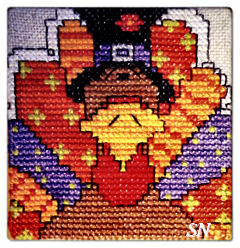 Her dress is candy corn -- and even though the fringe on the apron is only black cross stitches -- you COULD bead those. I love her shoes -- and you could add bits of metallic to them, as well. 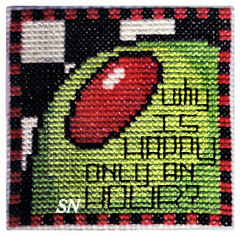 Stitched on Week's 30ct Chartreuse Linen she finishes approx 6 x 11. Offered as the chart with embellishments! Too Cute! Another of Amy's fun annual Santa charts, this year's has that fun little penguin on there -- the one that *Twirls when in doubt! 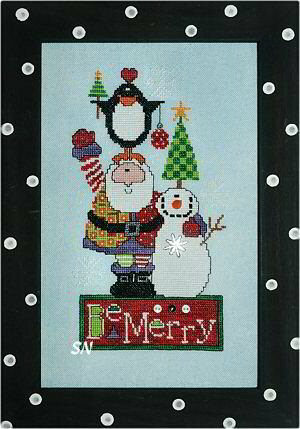 * He's cute just by himself, the snowman looks so happy nestled up with Santa, and even the 'Be Merry' block would make it's own cute ornament! 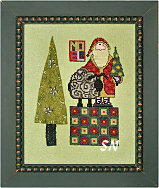 I love the textures in the designs of the tree and Santa's coat, too. Finishing approx 5 x 11, Amy has made a pink and orange clay flower to embellish, and there are glass beads garnishing the *wind* around this little guy!!! Offered as a single chart. 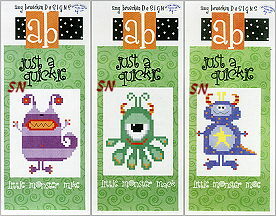 Stu, Sam & Syd: Little Monsters! Amy has a trio of new little scary people... to join Mike, Mac and Moe! Offered as small card charts, stitch them on almost any fun, bright color of whatever count you want... they are only 40 x 40-ish stitches each! VERY fun to work up on 10ct fabric with specialty threads, these belong in the bedroom of some OTHER scary little person in your life! Just the cutest -- look through your metallics, and buttons to jazz them up! Each is a separate little card chart. Well, al-righty-then! This is so simple, so cute and SO PERFECT for so many people!!! Offered as the chart with button embellishments, the model is stitched on Weeks 30ct Sophia Pink linen. You can do it on anything you like, and in any colors you like -- especially if you have issues with that fabric or those colors. 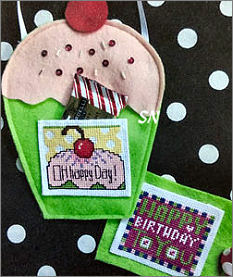 You can even get the buttons separately -- but only in the pink and green set offered -- issues or not! Just a delightful piece -- a gotta have! Check out $#!%! -- also new chart in AB's little world of charming attitude! 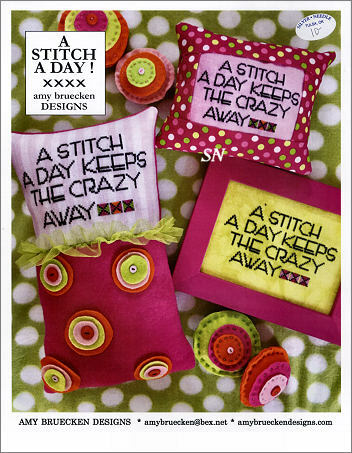 Stitched on anything you want... we suggest a cool 10ct Tula and #5 Perle Cottons to make them fun bed pillows. The stitched area would be around 3 x 4 for each one... then elaborate with fabric trims and edgings. 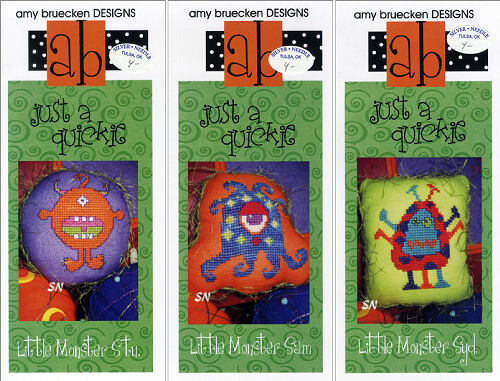 Every little person would love these funky and weird guys all stitched in fun, bright colors -- add some crazy eyes if you have them, or a silly button or two. Whatever you do... the patterns come as three separate small charts -- waiting for CREATIVITY! 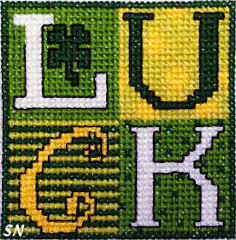 Coded for DMC floss. AB Designs' Amy has released *A Whole Bunch of Cute! * We have Kitty 4 Sale... a new Santa, 3 new spiders and 2 new fobs!!! Let's start with that errant kitty! 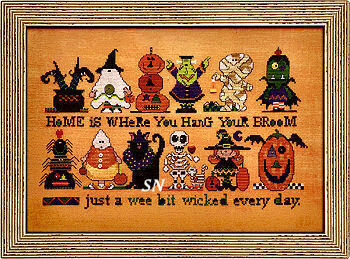 Stitched on Week's 28ct hand-dyed Straw Gingham Linen, the little witchie has a hair-do of DMC Memory Thread (coated wire to twist and shape) -- you could use orange, green, purple or black. 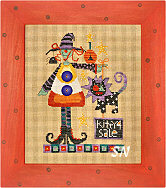 She has a sticky-outy nose, and she is peddling the CUTEST little kitty! I think he's my favorite part about the whole piece! Offered as a single chart, she finishes approx 4 x 10, and comes with her embellishment pack of nose, beads and buttons. Oh, this little guy is really cute this year! 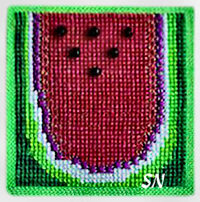 He is stitched on 30ct Guacamole Week's Linen with various hand-dyed flosses. 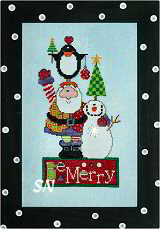 YOU GET the pre-cut felt tree piece and the silver beads to adorn -- all with the chart! 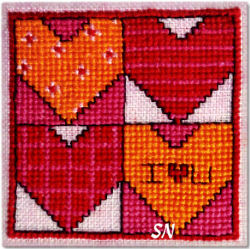 He finishes approx 3 x 7... cute for a cube stand-up or little pillow. That wool tree adds a nice touch of texture and a bit of *unique! * Restful colors of dusty greens and deep reds. Offered as the chart with embellishments. Quite the Party Couple! Amy has these worked on Weeks Dye Works 30ct Chartreuse Linen -- and it is *BRIGHT! * Stitched with DMC floss, you'll need her garnishment package which includes the necessary spiders, beads, noses, and shoe laces. What you will also need is some DMC Memory Thread. 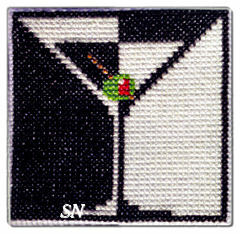 It is a covered wire product -- green on Jack, and black on Jackie -- that you simply twist and shape, and then attach to the finished needlework. 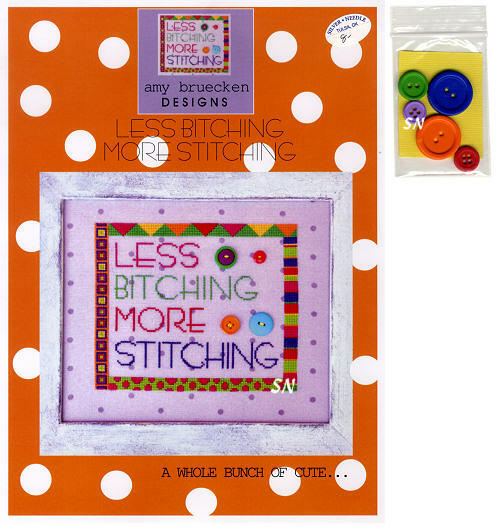 Amy uses it a lot, and since one package has 3 yards on the card... it'll go a long way. Anyway, J & J finish approx 6 x 10-1/2. They look pretty good next to The Frankster and WitchyPoo! Lots of great linen color and design impact for all 4 of these. 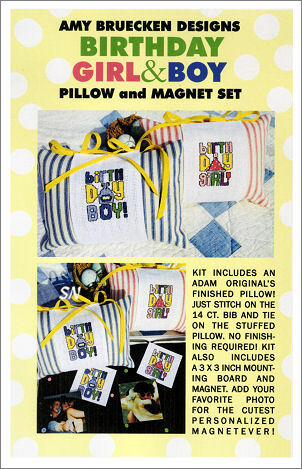 AB Designs has finished her 4-season set of Stacks with these two bright, fun, fresh warm weather themes!!! Amy's original artwork charted to stitch on Week's Guacamole linen in bold overdyeds, you just can't help but love these! 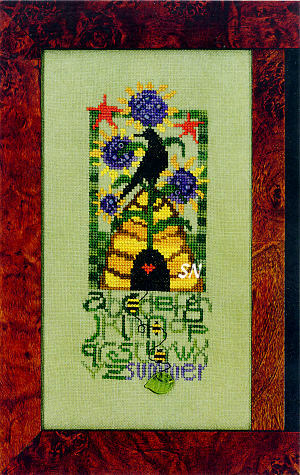 Offered as a chart, it features lavender bead embellishments, and Bees even sports a green glass leaf! Companions to Stack of Winter and Stack of Jacks, in Amy's words -- A Whole Bunch of Fun! 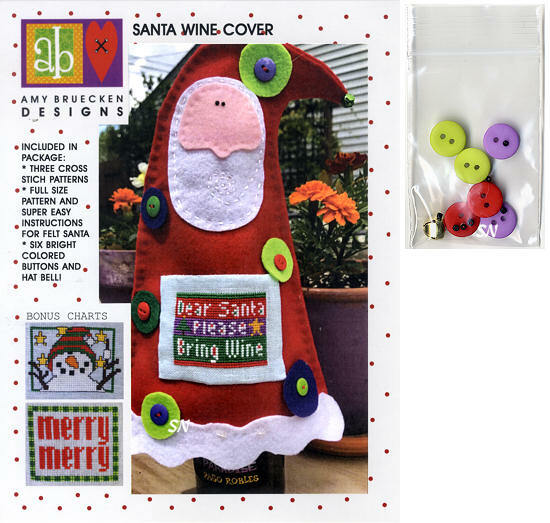 Amy Bruecken of AB Designs has another really fun Santa Claus this year -- he and his little buddy are sporting DMC Memory Thread embellishment of their faces. 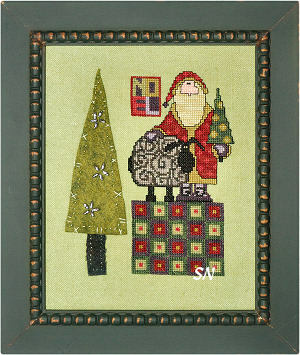 Santa is stitched on Weeks Dye Works 30ct Peoria Purple Linen in DMC and overdyed flosses. 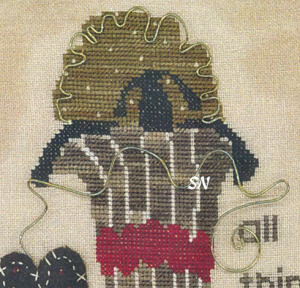 After all is stitched, take your black and white Memory Threads (actually thread-covered wire) and bend and tack down! The little snowman has a sticky-outy clay carrot nose, too. 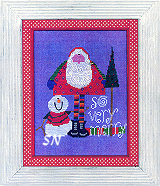 Very cute and colorful, So Very Merry is offered as a chart, embellishments, Mem Thread... all available separately. Note: One package of Memory Thread has something like 3 yards on it... If you have one card from a different project... you don't need more for this! 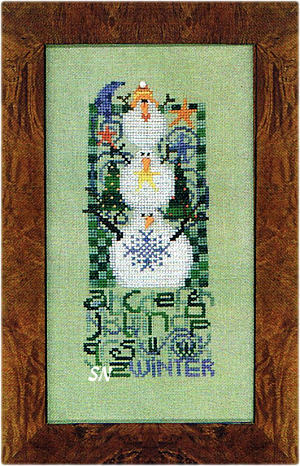 The second of the four seasons... Stack of Winter goes with Stack of Jacks! Three fat little snowmen, all stacked up, Amy's artwork is so cute! It's colorful, funky, fresh, lively, and just plain FUN! Stitched on Weeks Dye Works 30ct Guacamole Linen in various overdyeds, this is a great contemporary look. Offered as the chart with everything else offered separately. 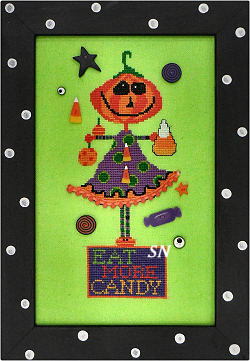 One of 3 new designs... AB Designs has the cutest new stack of pumpkins -- all decorated with Charcoal noses and wired Memory Thread smiles -- stitched in colorful overdyeds on Weeks 30ct Guacamole linen! 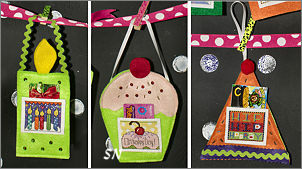 Offered as the chart, with embellishments, Stack of Jacks measures approx 3-1/2 x 7 inches -- actually kind of teeny! It is the first in 4-seasons... Stack of Snow will be Winter's design, (coming the end of Sept.) Stack of Butterflies comes for the Spring, and Stack of Bees is the Summer edition. The black Memory Thread is a coated wire that you bend and twist, to make any shape you want. It gets 'tacked' onto your finished stitching, and really POPS! 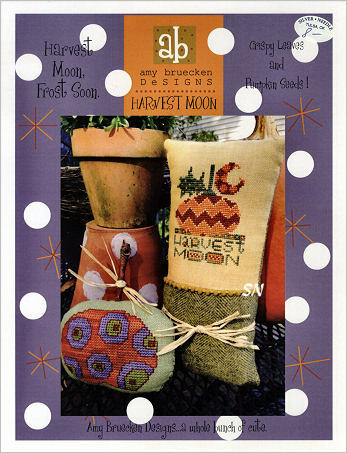 I just love the colors on this one -- green linen and backgrounds, bright oranges and yellows in the pumpkins, and that purple moon! 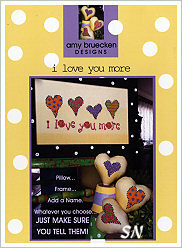 Offered as the chart with embellishments, the Memory thread is separate, and comes on a card of 3 yards, which will probably last you forever! 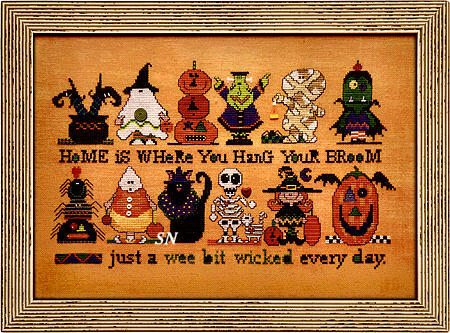 *Witchypoo's Main Squeeze! * ab Designs has sent us the cutest little Frankenstein monster to stitch, and we have plenty of time to finish him before The Big Day!!! 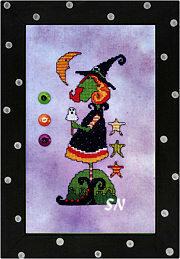 The 5 x 9 Frankster belongs to previously-published Witchypoo, and is stitched on Weeks Dye Works 30ct Peoria Purple. He features right, fun Halloween-y colors, and some DMC Black Memory Thread on his pumpkin's smile! 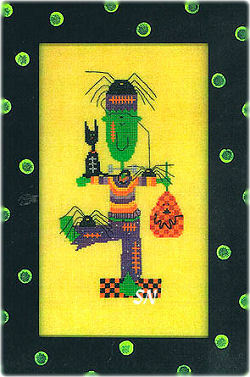 Actually, we think that Memory Thread is totally awesome, and it'd be fun on all the spider legs, too!!! 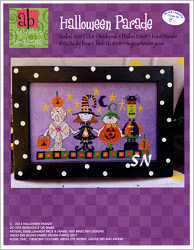 Offered as the single chart, check out the trio of smaller matching pumpkins, with those same wired-thread smiles!!! Such a cute set of designs! 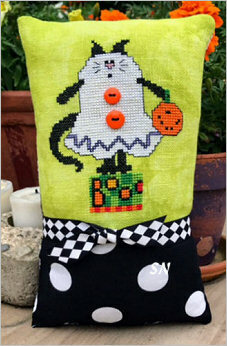 If you stitch Frankster and Witchypoo and these pumpkins... you'll have a trio of bright pieces... all on different lip-puckering fun colors of linen! 'A whole bunch of cute, a little scary, a pinch of creepy, and a dash of ick!' 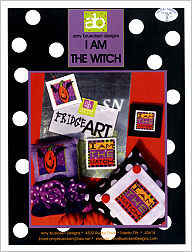 Ms Witchy Poo is so darn CUTE! She's stitched on Weeks Dye Works 30ct Peoria Purple Linen, but as Amy points out... there are several other colors and kinds of fabrics that would be perfect for her. Using DMC and overdyed flosses, our very favorite parts are her hat jewel, and her bright green sticky-outy clay nose! It has a black wart on it!!!!!!! Approx 5 x 11, there are seed beads scattered around the spiders, and their legs are long straight stitches. Offered as the chart with embellishments. Well... read it! 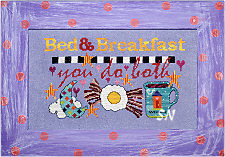 'Bed & Breakfast... you do both!' I'm thinking this is more appropriate for your teenager than the upcoming houseguest!!! Offered as the chart, it is darn CUTE! 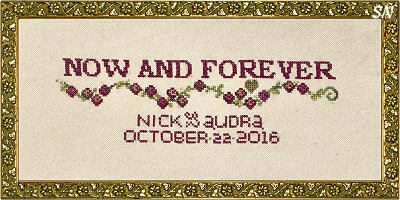 Finishes approx 10 x 7.
ab Designs has another charming design that uses the new DMC Memory Thread! 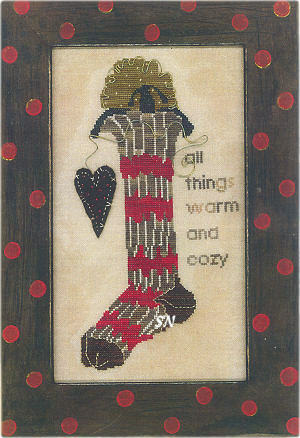 This awesome stocking would be awesome FINISHED as a stocking... it's stitched with Sampler Threads, and features a neat woolen heart applique, and a few red glass seed beads. Deep, rich colors of Apple Cider, Woodsmoke, Buckeye Scarlet, Dark Chocolate, Raven Oatmeal and Parchment... it just LOOKS like a comfortable old sock! Notice the curly-Q stuff around the sheep and holding the heart? THAT is the DMC Memory Thread. 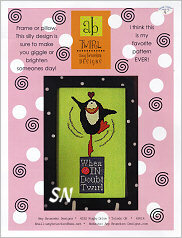 It's actually thread-covered wire that you twist and attach just however you want, to get such a fun and whimsical effect! This design uses the Gold color, and finishes approx 9 x 11 on 28ct. 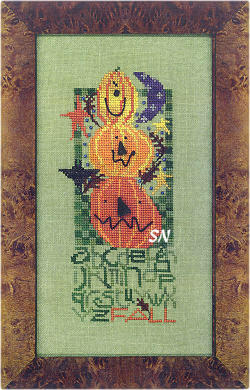 Offered as the chart with woolen heart and beads, linen, flosses and Memory Thread offered separately. An exuberant Santa, dressed in a coat of 'Merry Wildness', he's sporting a beard of the new DMC Memory Thread! First the coat -- swirls, stripes and polka dots of regular DMC cotton floss -- Be Claus is stitched on Weeks Dye Works 30ct Peoria Purple linen, in reds, greens, purples and white, and measures approx 6 x 10-1/2. 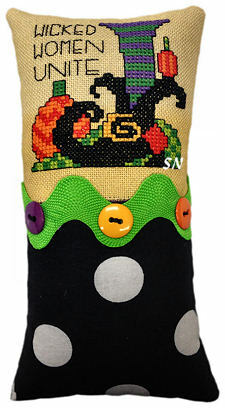 He's embellished with black buttons and some silver bugle beads. His beard has wired-thread curls all over it! DMC's new Memory Thread -- this variety of it -- is a thin copper wire, wrapped with cotton fibre. 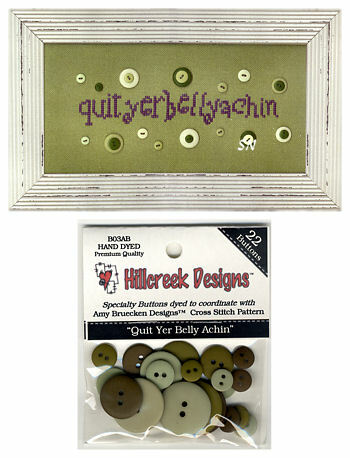 You wrap it around something like a pencil to get the little swirlies... and then just tack those onto the needlework! 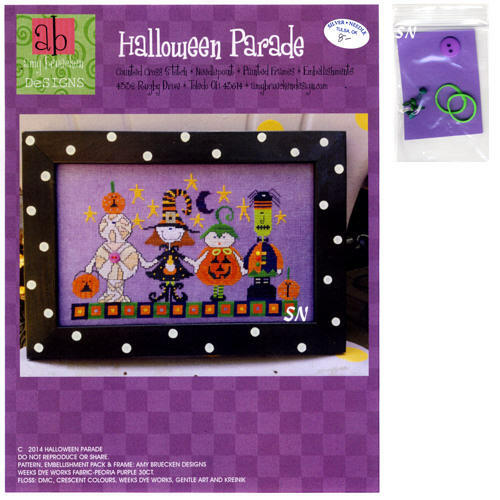 Totally fun and different... the wired Memory Thread comes in something like 14 colors on individual spools -- and we're getting it!Make sure to see ab's Halloween pieces that feature Memory Thread, too! Quite a favorite American saying to 'warn the whiner' ... this is a riot! 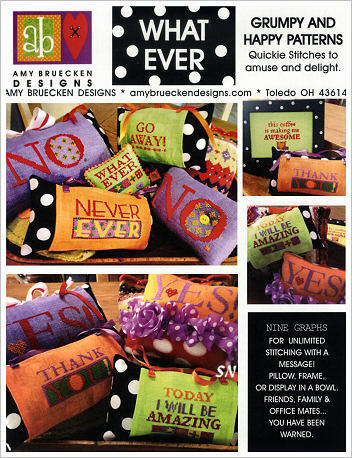 Amy Bruecken of AB Designs has 4 new One-Liners, each offered as a chart, and embellished with hand-dyed buttons. THIS ONE is my personal favorite, because my Dad used to say it to all five of us kids all the time!!! Just for fun... check out the other three, I bet you know someone who deserves one of these! 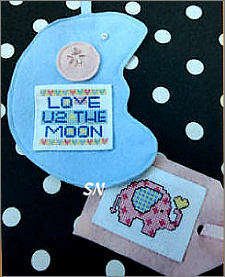 Offered as the chart with button set, stitching is approx 1 x 6 depending on fabric size, and then figure button placement. 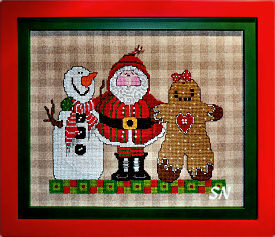 Here's a colorful trio of friends... Santa's coat trim is stitched in Wisper thread and garnished with red seed beads. 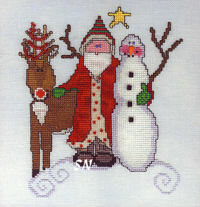 The snowman has that cute pointed clay carrot nose, and the reindeer has antlers full of a red bead garland! Offered as the chart, this is smaller than the rest of the Sisters & Best Friends Santa patterns, and finishes approx 6 x 6-ish. Lots of pretty fabric options for them, too!